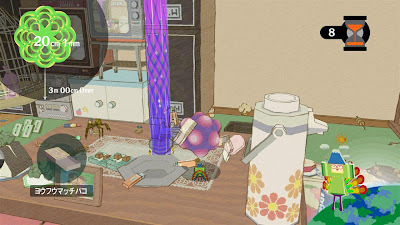 When I ask people if they’ve heard of Katamari Damacy, most of them look at me like I’m insane (more than usual) of course I couldn’t really blame them for not knowing, the Katamari series has been going since 2004 but has remained (and probably always will remain) a very Japanese game as evident from the intro sequence to We Love Katamari into on the Playstation 2 in fact all I have to do when showing people the game is mention that it’s Japanese and they understand, slightly. I really don’t know how I originally came across the series, I think I was looking for something out of the ordinary something more puzzlesque, something that only the Japanese could think of and basically I just decided “yeh this looks good”, I can’t really remember owning any other games of this type on PS2 or even on PS1, it was one of the more bizarre purchases that I made and I’m glad I did, otherwise I never would have been given the chance to remake all the planets and stars by rolling up objects on earth then vaulting it into space. The Katamari series has a simple concept, that’s simple in the way of the gameplay is simple don’t ask me about the finer points of the storyline or characters, this game is very Japanese, that’s all you need to know. The basic way to play is that you control the Prince who is the son of the King of all Cosmos or one of his Cousins. While playing you push around a Katamari which is some kind of magical ball that sticks to things it rolls over collecting them on the way in a snowball like effect, the Katamari ball in itself can come in many different colours shapes and sizes to start off with, the Prince and his cousins are only 5cm tall, but are able to push around a Katamari that has grown to the size of a landmass. The storylines have varied over the years, a sort of recurring theme is that the King does something silly then ends up destroying all the stars in the sky then gets the Prince and his cousins to roll up Katamari’s on earth in order for him to shoot them into the sky and turn them into stars. The levels basically consist of rolling up a Katamari to the determined size in the determined amount of time, but there can be variants on this including rolling up as fast as possible or rolling up only certain things. 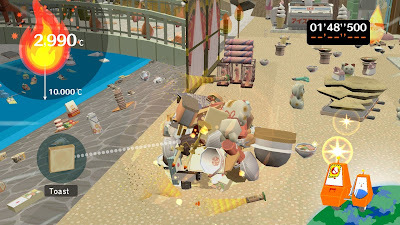 The gameplay, much easier to understand in action, can you spot the Prince and the cousins under the Katamari rolling it? 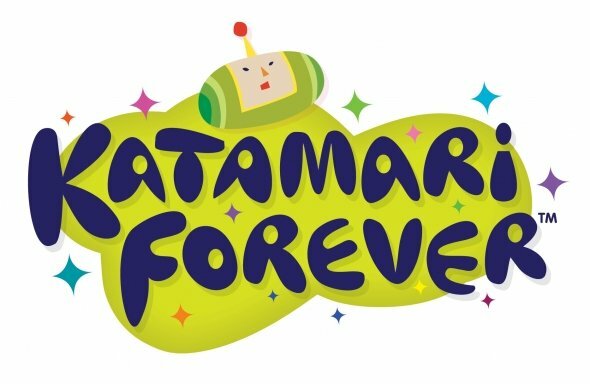 My first Katamari Game was on the PS2, this was entitled“We Love Katamari” this was the sequel to the first Katamari Damacy. The storyline in We love Katamari was largely based around the people or‘fans’ of Katamari rolling possibly from the previous game, I really don’t know how you can be a fan of being rolled up by a giant inwardly magnetic ball and repeatedly crushed into the ground but of course I’m not here to judge. I really enjoyed this title all the way from the main menu to the final credits, the storyline was wacky but believable, the gameplay and learning curve was solid, the simple graphics suited the game fine with the trademark colourful blocky style, the replayability was interesting in a way that it made you strive to get better results rather than starting a new game over again. I really liked the way you controlled the Prince or another cousin and you ran around a meadow which served as a menu system and you talked to the fans of Katamari Damacy who talked to you about how Katamari Damacy has somewhere influenced their lives or how they need help and you would be flown up to the King who would give you your task whether it be make a Katamari that is big, enough, rolled up fast enough, made of the right material or just do whatever the hell he says which can be anything from rolling up a flaming Katamari to make a campfire, rolling up students at a school to send them home or rolling up as many animals as you can. Animalz! we needz da animals! By playing these levels unlocks a multitude of other things i.e. 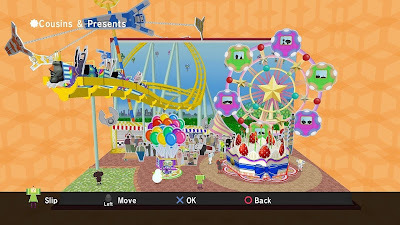 more levels obviously but there are also Cousins and Presents that can be rolled up, any cousin who is rolled up the first time can be used as a playable character. The presents however are used to dress up whichever cousin you are using at the time, the presents come in 3 different categories, head (headphones/crown), face (long nose/mask) and body (guitar/horsey). Which Cousin you use or presents you are wearing makes no difference to the way you play it is purely cosmetic. 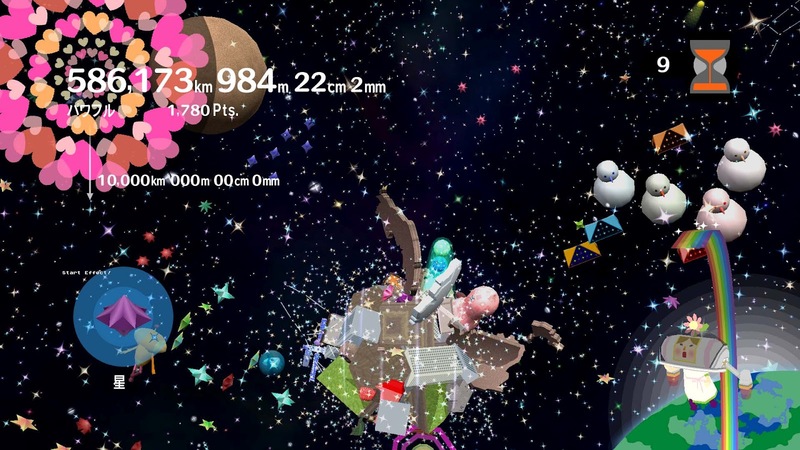 Basically you unlock more fans of Katamari from Sumo wrestlers to old ladies with a variety of different ways or reasons to roll a Katamari until you eventually make enough planets and stars to roll up the sun, as you do. 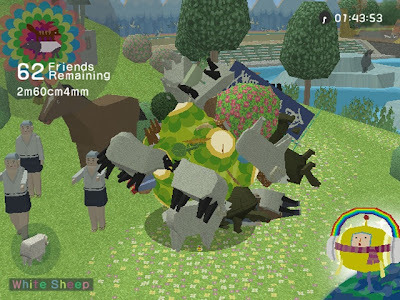 We love Katamari was great game and a great introduction for me to the Katamari series, I had heaps of fun and put a lot of effort into it and think I did the best that I could, there hasn’t been many games where I’ve tried this hard to get the best scores I could and I think this one had the spirit. Similar to Minecraft I would recommend it to anyone, they might be put off by the initial look of it at first, but after they play it they just might like it. I was quite surprised when I saw that this game had been released, though I understood why when I realized the game had never come out in Australia. I only heard about it 3 or 4 weeks ago and had ordered it online. 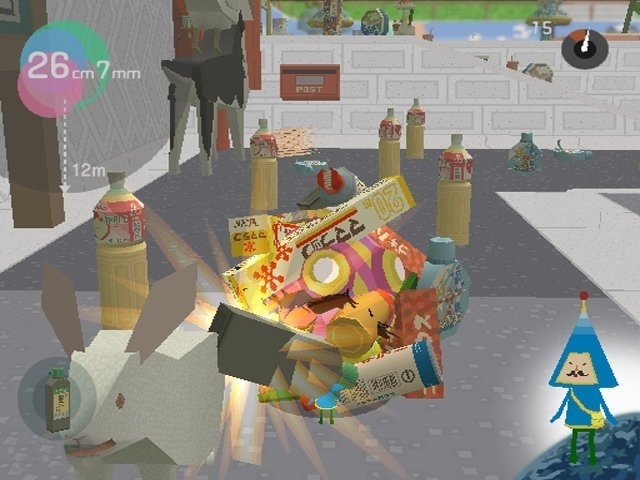 I was excited that I had actually found a PS3 version of the Katamari series as my only option currently on the PS3 was NOBY NOBY BOY from the same creator (more on this at some point). When I found that this game was actually a‘Tribute’ or a collection for the original Katamari Damacy and the We love Katamari that I had played on PS2 I wasn’t too worried as I didn’t mind replaying the old levels that I’d played and I was eager to play the new levels from the original. Though this was the same Katamari as before there were a few things that did annoy me first of all, the game's basic graphical style is cel-shaded, now this looks ok (it does cause slowdown in some places which is kind of odd) but if I want to switch to the classic graphical version I should have the option right from the start. 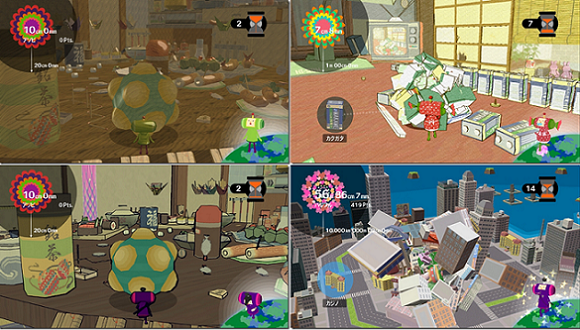 In Katamari forever you have to randomly unlock the other graphical versions which and so far I've completed most of the game and have only found the 'wooden' style and even then you can only play the other style once you have played the level once already. This really disappointed me as I was not a fan of the cel-shading from the start. The 4 graphical styles avaliable including wooden and comic. The storyline of this escapade was that one day the King was teaching the Prince how to do a super jump then he jumped too high and hit his head on a meteor knocking him unconscious.The Prince and the cousins then decided to build a Roboking in order to do the King's work, but the Roboking malfunctioned and you guessed it, destroyed all the stars in the solar system yet again. So basically you do missions for two kings, Roboking's missions revolve around the usual making the Katamari as big as possible or a certain size whereas the King's level are more object or special process based i.e only picking up animals (as before) or only picking up hot things. 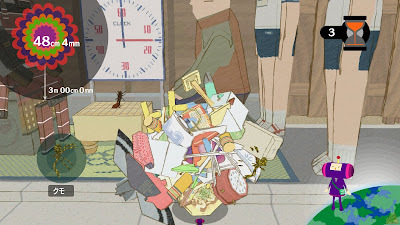 The King is dreaming so all the objects are in shades of grey until you pick them up and he remembers them which makes things kind of hard in some special missions.The storybook menu layout is pretty good though not all of the cousins will be on the screen at the same time. 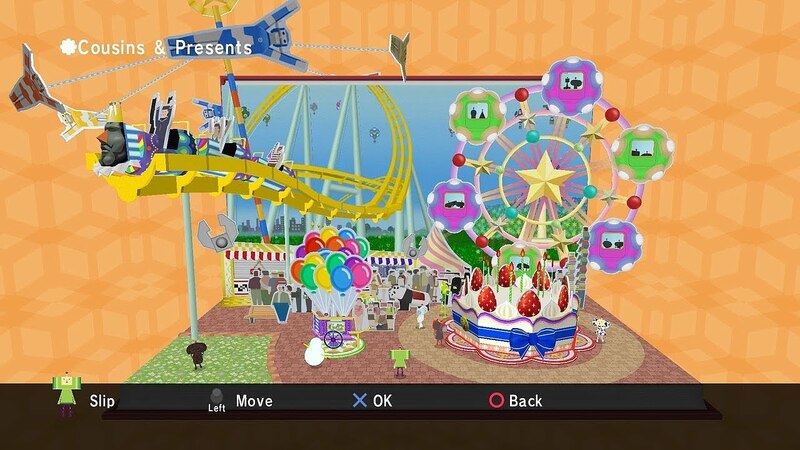 One of the menu screens, this one shows the cousins and presents screen where you can select which cousin you want to play and what they are wearing. 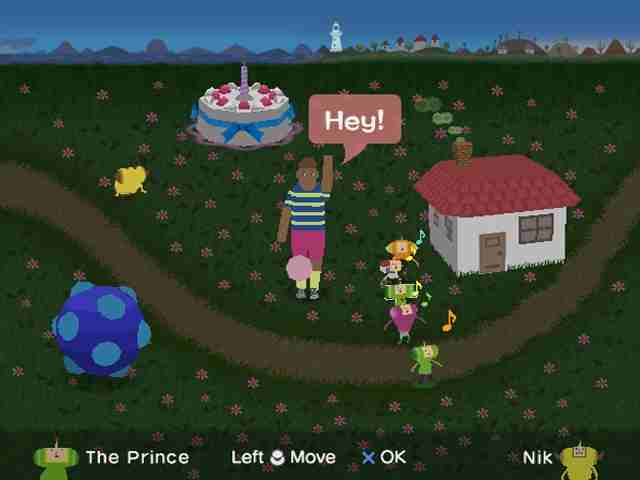 Some chnages to the game was the Prince hop where you can now jump with the Katamari to reach higher places and the Kings and Roboking's heart and broken heart which pulled items toward you, so you had to work out when to use them at the best possible time. I found the levels to be varying in difficulty, there was some where I struggled to do well or even complete whereas others I could ace by just doing my usual thing but the new content and variety made it good enough. The music was fine although a lot of it was remixes of the past songs from We Love Katamari which didn't sound that good. We love Katamari was adequate, it was good to play some of the levels from the original Katamari on PS2 and the PS3 definitely needed a Katamari game for anyone to discover the series. Despite a few shortcomings that I found it was fun and entertaining enough to warrant my purchase and I do concede when you buy another game of the same series it is not as good as the first, but between the two games I love Katamari the most.